Hi everyone. I did a search on this and as always I get too much information, so if you'll forgive me, I will just come out and ask my question. Someone gave me a cheap "COV NewGen Atomizer" and I'm having a difficult time getting it to work good. Here are some of the things I would like to know. 1. 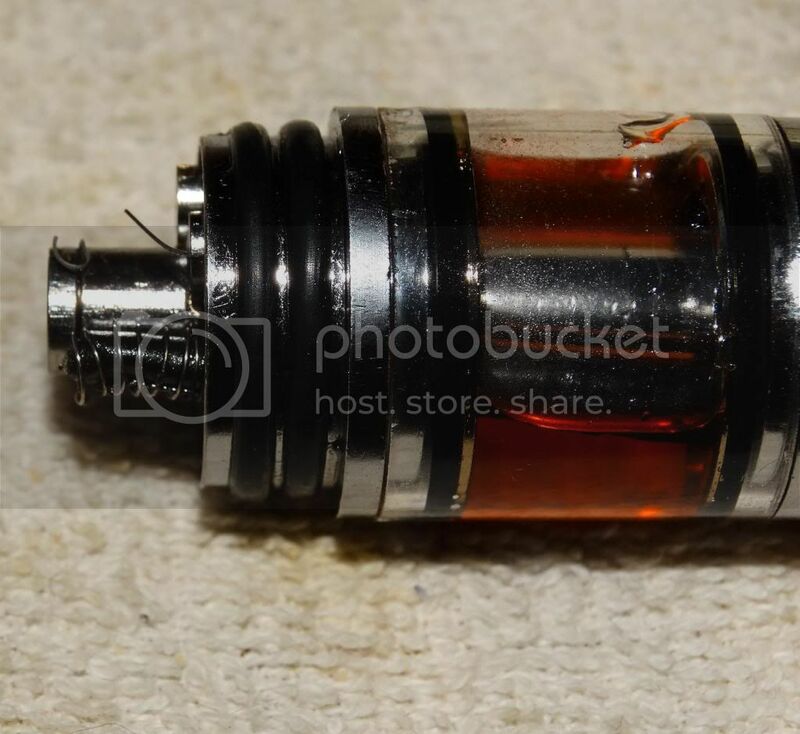 After you put liquid in the tank, are the coils supposed to still light up? 3. It has a very small air hole. Would it be better to drill it out? coils should not glow or light up..
they will only light up if the juice is not going to the wick,or pretty much dried up. well 2nd queston is connected with 1st..
9.9 error usually mean you are have a short on the coils,either the coil is touching the base or oner of your coils is touching the post. what kind of coil are you running spaced out? and also the wire might be wrapped too tight on the wick not allowing the juice to flow.. Thank you Zeus for the help. I just checked my coils again and the bottom coil had a hotspot. I fixed it, but the Vamo still gives me an error. But I can use it on my plain 3.7 mod I made. The factory hole is 1.5mm. I will probably use a small drill and make it a little bigger. I'm not sure what kind of coil I'm using because it came with the RBA and they didn't say. I "think" I might have it now and just need to drill the hole bigger. I'm going to do that and let you know how it comes out. Again, thanks. I appreciate it. I just got through drilling out the air hole. It's a little bigger than I should have made it, but it's certainly changed the vapor production. Now that I have it working better, I will put some better juice in it and see how it does. yup drill the holes out and if possible align it to be directly infront of your coil to increase vapor even more. as for the coils,well,those are probably stock made ones,just try tightening the post a bit see if that helps. as for the vamo error.have you used it with any other atty? just to rule out that its not broken..
let k=me know how it turns out i will help as much as i can. Thank you so much for your willingness to help. I need it because it's my first RBA, lol. And yes, they must be stock coils. The RBA actually came pre-wired but I didn't like the way it was performing and did a new coil. It got better in some ways, worse in others. Hotspots keep coming back and I have to mess with it much more that I think you should. Today I had hotspots on the top and bottom coil. I got rid of the bottom hotspot, but it seems like the top one keeps coming back after I fix it. About the Vamo, I can use the tank on my vv eGo mods with no problem. I'm guessing that they don't have the circuitry to check things like the Vamo. I'm guessing this is what you mean by trying a different atty. I will check the positive post when I write this. I still have a little wire sticking off the positive and negative posts. I'll trim those off just in case it's giving me problems. When I worked it the last time, I found out that the positive post needed to be screwed down a little more because the wire came off of it when I was messing with it. Thanks about the tape idea. I will probably need to do that because the draw is much too airy now. I'm going to chance juices when I finish here so I'm comparing apples to apples. I'm using an iClear tank on my Vamo and it's working just as good as the RBA. The videos I've seen on YouTube show that the RBAs get considerably more vapor than other tanks. Mine does not. Will let you know how things turn out when I work on it again in just a moment. **wall of text**p.s can you take a photo?so we can see atleast? 1 less of a hassle in dealing with hot spots. close to 0% of gettting one..
thou on a vamo,i suggest your target ohm should be above 2ohms..then have the airhole directed at the coil itself.. Thanks man... Sorry for the delay, but I had to help my lady with some housework. I've heard of people wrapping the wire around things like nails before and I think I might give that a try. I just re-wired another coil using the "nail wrap" technique you talked about. It was still tough but I have it working now with no hotspots. It will have to break in a little more, but for now it's doing good. However, it's not really doing any better than before. I think that I just got too cheap of a RBA. Should have got something like the AGA-T2 or something. do not worry mate,no rba is too cheap,my igo-l is cheap even cheaper is a china era,both of which can out perform any high end rba,and given day. what gauge of wire are you using? what ohm reading does it read now. to maximize vapor...try aligning the airhlole to the coil,,you should see the coil on the airhole itself.do not cover it up yet. Thanks for your thoughts on cheap RBAs. Makes me think there's some hope, lol. I don't know what gauge wire came with the tank. To me, it looks pretty small, but appears to be like the ones I've seen on YouTube. I usually use the Vamo to check ohms. I'm not real sure how to check the ohms on a meter. Can you give me some help with that? I put the meter on the ohms setting and connected the wires to the positive and negative posts. It showed .01 ohms. I don't think that can be right. I know about aligning the air hole to the wick, so I got that part right. I'll try to make a picture in a little bit. I'm looking at micro coils right now on YouTube. first on your current build..
does the vamo read your at all?what ohms? hehehhe i do it always. not sure if it has reprecautions thou. get something like a precision screw,a small nail ..
if you have a torch torch the wire until it glows,careful not to torch yourself. now on the the nail leave like half an inch or so,or just enough for you to hold the wire and the nail together..
wrap the wire around the nail as tight as you can..
remove nail dry fire until it glows,then pinch with pliers so they compress some more. when compressing,the mod should be off,or not firing..
Oops... didn't read your message good. I touched the coil "after" I wound it around the nail. I did a 6-5 wrap on the coil, no hotspots. This time it's producing less vapor than before, sigh. What affects vapor the most? I wonder if I'm not winding the coils tight enough? On YouTube, after people get through making the coils, they get tons of vapor. you have something there no more hotspots right? can the vamo read it out? close to each other right? how about taste? and th? can i see a pic?pretty please? I'm trying to use it on my Vamo, but I always get an error (9.9) and with what you said, I guess the ohms are not high enough. I don't know what gauge wire I'm using, but it's looks like what you have in the picture. The taste has been good on some wraps but on others it will have a metallic taste. TH is good when I can use my eGo winder. One thing I noticed is that I have to keep screwing with the coil after I already have it right and I'm vaping. I don't know if this is because the coils are too lose or what And my coils are not always close together. The 7-6 wrap is the most I've been able to get on the coil so far. Yes, the air hole is aligned and it makes a difference on the amount of vapor. I'm going to have to wait and get my lady to take a picture, but will have one as soon as I can. She's good with a camera. I take blurry pictures. I've run out of wire. I still have some old ones left but they have been cut off and I couldn't get more wraps on it. I'm going to try and use the wire off of one of my Nova replacement wicks. Had to take a break before I threw the RBA against the wall, lol. If I understand you right, it's the number of wraps that affect what the ohms will be... right? Extra info: I use an iClear on my Vamo. The heads on the iClear are 2.2 ohms and I run it at 4.2 volts. So far, it has been out performing the RBA with vapor and TH. a part of the coil is either touching the base/post or the top cap..
check any of these if none please indicate,also check with another topper if it measures out,just to rule out that device ain't broken..
pulsing is basically firing until it glows,turn off,then turn on again until it glows. tanks are ss,so not really cleaned yet. ss mesh.well,not sure how to solve that,,oxidize it somemore? example my 40mm wire 10 turns would only be 0.9ohms.. Thanks for the info. I guess you missed the picture. I think we were posting at the same time. I just got a note from someone else that said that the coils should still glow even with juice in the tank. I've been trying to not make it glow when juice is in the tank so maybe that's my problem. cool looking genny looks heck of a lot better than my aga..
the coils look actually great. as for oxidization,i can;t help you much on those,since i gave up on ss mesh a long time ago,plus i aint a fan of the genesis tilt. for the actual coil those are neat for spaced coils really. can you try putiing in the vamo and measure resistance? and dry fire?see if you have hot spots.. The coil windings are touching the positive center post (A short or short of some of the windings) This will give you a low resistance coil reading, the coils that aren't touching will be very hot. The coil windings are too loosely wound. You will get poor to no vapor. As a beginner, you should carbonize the mesh before wrapping the coil to insulate it from a short. When you progress to extraordinaire coil builder you can fore-go the carbonizing. Lately I have brushed my rolled up mesh tube against some cotton and form a very thin layer of cotton around the SS wick before wrapping the coil around it. The coil wraps should be snug around the SS mesh but not so tight as to make it short. It's all practice, trial and error. Did you see the ZEN video I posted about "Adjusting Coil for Even Glow" ? Hi BT, thanks for joining in. We decided to keep this public just in case it might help someone else down the road. Thanks for your observations. I will make sure I keep your suggestions in mind when I make the next coil. It's hard to know (or describe) the difference between having the coil tight or too tight. thanks for that i failed to see that they are touching the positive post. same reason why he is getting the 9.9 error. Ok folks, I finally got it. It's putting out tons of vapor and has a good TH. Although the people who know how to do it right won't think that this is a big deal, for me it was a make it or break it understanding of how to wrap the coil. The trick is to make the coils tight around the mesh (thank you BT). But not only tight around the mesh, but keep it tight when you wind it around the positive and negative posts. I wrapped it once tight around the mesh but not around the posts and it sucked. So I redid the wrap and made sure it was tight all the way to the posts and that made all the difference. Now I'm going to take a much needed break, LOL. i am not sure iif i did help ,I was blabbering most of the time I think. but hopefully all 3 of us was able to help someone who is too shy to post and just lurk around.